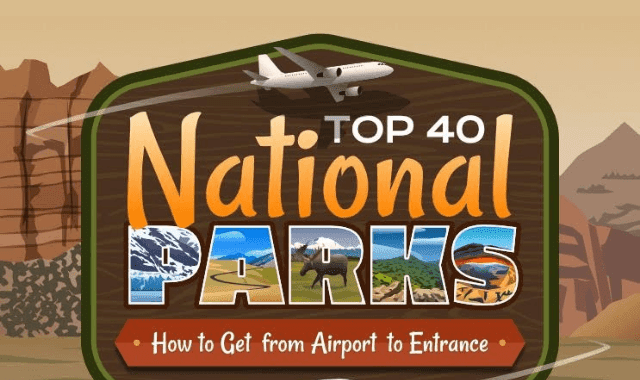 Top 40 National Parks: How to Get from Airport to Entrance #Infographic ~ Visualistan '+g+"
National parks have been called “The best idea Americans ever had,” and rightfully so. From lush ecosystems to harsh desert landscapes, there’s an abundance of diversity across the millions of acres that make up the U.S. national park systems, with something to offer for every kind of traveler. Exploring national parks is the epitome of American and every year, more than 331 million visitors take to the open road to visit these natural wonders and their unforgettable terrain. Since several regions in the U.S. are home to a variety of parks, it’s common to visit more than one per road trip. Some parks are easily accessible and within close proximity to major cities while others are remote and require extensive driving or flying time. For many visitors, the national park road trip begins with renting a car at the airport, so understanding the best locations to fly into and how long of a drive you’re up against, is essential for a smooth trip.